A friend had a housewarming party this weekend with a Quentin Tarantino: come as a character from a Tarantino movie. 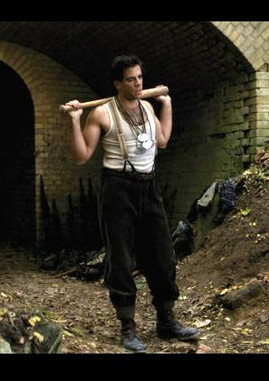 I dressed as Bear Jew from “Inglourious Basterds”, even though I haven’t seen the movie, because I wanted something simple and cheap. I only needed to buy the pants from Goodwill and tweak them a bit. I didn’t take a before picture, so just imagine them too big for me around the waist and hips. I made the suspenders out of pieces of a graduation gown and safety-pinned them to my pants. 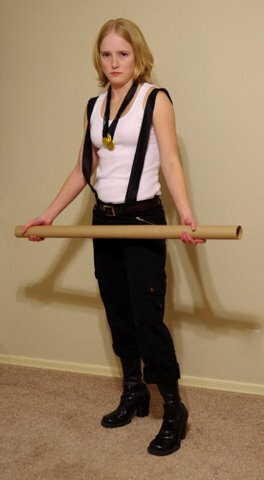 I didn’t check the reference picture again until I was already done, at which point I realized they’re supposed to be tan suspenders instead of black. The Nazi dog tag trophies are chocolate coins from a Hanukkah party, taped to more strips of commencement gown. The Nazi-killin’ bat is an empty wrapping paper tube, and I wore my ratty old boots and reversible black/brown belt. Total cost: $5.99 and 25 minutes. I also helped a friend with her costume as Gogo from “Kill Bill”, shortening a Goodwill skirt and lending her socks, a button-down shirt, and a necktie. The broken zipper is held together with safety pins for now, and I’ll add snaps before she puts it in her costume bin. December 12, 2010. Tags: completed project, costume, Goodwill, refashion. Pictures, Projects, Words.